Dogs communicate through their eyes. Happiness of seeing you after a long day or being sad when they’re scolded, your pets’ eyes have a unique language. Find out about some of the most common eye disorders in pets and take care of their eyes. As a pet parent one can easily detect any changes in your pooch’s eyes like – injury, infection, yellowish discharge, or opacity. If treatment is delayed, he may start scratching the eye and the situation may worsen. Breeds like Pug and Pekingese having protruding eyes can easily damage their cornea leading to corneal ulcers and other problems. Some eye problems can lead to sudden blindness. It is best to consult your vet at the earliest, so that your pet gets proper diagnosis and treatment. A growth appears on the surface of the eyelid. It’s most common in old dogs, after the age of 8 years. The growth may rub against the eye surface causing discharge and may damage the cornea. Eye tumours are benign and slow growing. These can be removed surgically. Eye cysts can cause blindness and inflammation; these can also be easily removed. In cases where tumours growing inside the eye, the affected eye may have to be removed. Your pet’s eye may be damaged during some fights or bleeding may occur due to accident/injury. Breeds like Pug or Pekingese develop prolapse of the eyeball. A vet may reposit the eyeball in the socket under anaesthesia. Both the eyelids may be stitched together and kept so for few days. Analgesics and antibiotics can reduce the swelling and prevent eye infection. This condition is also called Kerato Conjunctivitis Sicca (KCS). The tear glands in the eyes fail to produce enough tears which make the eyeball look dry and dull. It predisposes to bacterial infection and causes thick yellowish discharge. Dry Eye is usually seen in older age dogs. It can be treated with antibiotic eye drops. Some cases require surgery of tear gland ducts. Eye infections and inflammation can cause tear duct choking. This would lead to tears overflowing and staining the face. The infection can be treated with antibiotics and flushing of tear ducts. Breeds like Pug have protruding eyes, and may cause damage or ulcers while scratching. The cornea gets cloudy blue or grey in colour. It retains the fluid and gets bulged. 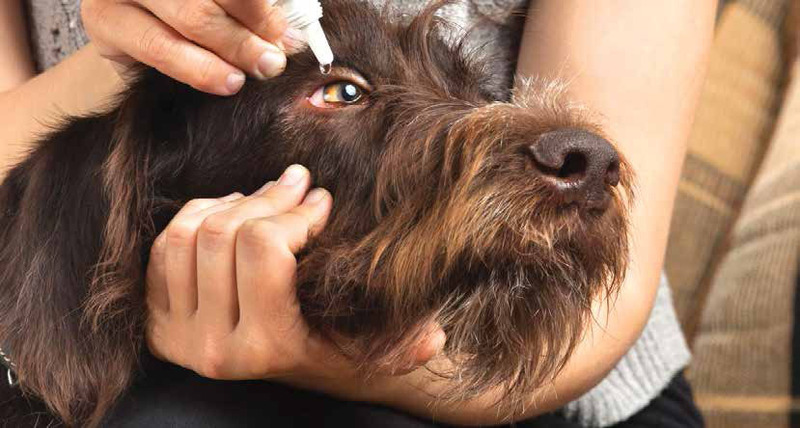 Your vet might suggest injections or eye drops to treat corneal ulcers. Changes occur in your pet’s eyes when cataract develops. Cataracts usually develop with old age. But sometimes cataracts can also occur due to viral diseases, diabetes, auto immune disorders. If not treated on time, cataracts can lead to partial or complete blindness. Cataracts can be treated surgically. It’s clouding of eye due to deep inflammation of the cornea. Sometimes Blue Eye develops as a result of viral diseases like Infectious Canine Hepatitis (ICH). It can be treated using eye drops and antibiotics. While applying shampoo or any other tick medicine, if it accidently enters into the eye it can cause irritation and reddening. Dirt, dust, and pollen can also cause eye irritation and allergies in pets. If a foreign body enters the eye during an accident or injury, it can cause irritation and allergy. Anti-inflammatory, anti allergic eye drops with some antibiotics can successfully cure the condition. These are inherited disorders. In this condition the affected dog is confused with the surroundings and bumps his head against any object, wall, etc. Such dogs should not be used for commercial breeding, as the chance of the disease being transmitted to the young ones is high. Treatment is possible and in some cases the visibility remains up to 20 – 30 percent. But timely treatment is very important, or else it may lead to permanent blindness. Glaucoma is a condition which causes excess pressure in the eye. This leads to inadequate fluid drainage in the eye. If the condition becomes chronic or persists without treatment, it will eventually cause permanent damage to optic nerve, resulting in blindness. Your vet might suggest some eye drops and preventive medication. Cherry Eye is a disorder of nictating membrane, also called the third eyelid, present in the Eyes of dogs and cats. Cherry eye is most often seen in young dogs under the age of 2 years. This defect causes the gland to prolapse and protrude from the eye as a red fleshy mass. It can be corrected by surgery. It is a common condition in dogs where the lower eyelids droop or roll out. It can affect one or both eyes. It’s often inherited and has a strong tendency to occur in dogs with loose droopy skin. Breeds like St. Bernard, Great Dane, Bloodhounds, Bullmastiffs, and Newfoundlands are most susceptible. The condition can be corrected by surgery. It’s an abnormality of the eyelids in which the eyelids rolls inward. This inward rolling causes the hair on the surface of the eyelid to rub against the cornea resulting in pain, corneal ulcers, and corneal erosion. In most cases both eyes are affected. It can be corrected by surgery.